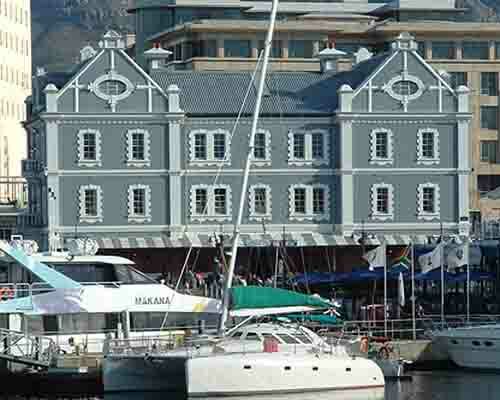 There are a number of boat cruises available in the V & A Waterfront for visitors to enjoy. Some of them are very short and take you into all the basins that form the V & A Waterfront. All the quays in the harbour are numbered and on these trips the uses of the buildings on them are explained. Here and there some of the very old buildings have been renovated and stand proud amongst the newer buildings that have been erected. A number of cruises also exit the harbour area and head out into Table bay. There are some exciting ones especially when the boats use sail once out in the bay. Watching the sails fill out and the boat heel over as the wind takes effect is enough to bring excitement to any sailor's heart. A number of sundowner cruises exist and this week I was lucky enough to be invited to attend the opening ceremony of a new cruise that is being introduced on Wednesday evenings. The cruise leaves the harbour at about 7.00pm and makes its way around the Sea Point coastline and enters the bay at Clifton stopping about 200 metres from the world famous bikini beach. While on the cruise snacks are served and a cash bar on board allows you to have a couple of sundowners while you watch the sun set into the Atlantic Ocean. Nobody can imagine the splendour of Table Mountain and the Twelve Apostle mountain range as it first turns orange and then black as the sun drops below the horizon. I am sure that this particular cruise will become extremely popular as it allows people a midweek opportunity to do a sunset cruise. On the outward leg of the cruise the coastline is bathed in sunshine and once the sun sets a whole new spectacle can be seen. As darkness sets in the lights all along the coast start to come on and the view from the bay is quite spectacular. I cannot explain the emotions that an evening cruise into Table bay can awaken in you but I can recommend that you experience one for yourself. We'll see you there soon!